National Chili Day is on February 27th! I include chili in our dinner rotation quite often during the colder months of the year. It’s so easy to throw ingredients into a slow cooker and let it do all the work. Your house fills with the aroma of delicious food and at the end of a long day, you have a hot and tasty meal to enjoy. Most people I know have an ingredient they say makes their chili the best. I recently discovered that adding red wine vinegar to chili really brings out the flavour. I’m using it in all my chili recipes. I guess you could call it a “secret ingredient”. Some people use chocolate as their secret ingredients while a few say to add beer! This list of 101 delicious chili recipes will leave you with no shortage of new ideas for meals! What’s your go-to chili recipe? Now that is a list!!! Thanks for including our recipe. I will definitely be trying many more of these! Thanks for including my Chili recipe in the FANTASTIC list!!! Thanks for the chili recipes…can’t wait to try them! Wow! Thank you for posting these. I have been wanting to try another version of Chili and now I have so many to choose from. With 101 choices, this list is big enough for me to never have to look anywhere else for more (additional) recipes. Oh my goodness! So so many wonderful recipes! WOW!!! Thank you so much for getting all these awesome chili recipes together. There has to be at least 20 recipes out there to tickle every ones fancy!! I can’t wait to go through these and make some of them. We LOVE chili in this house and since spring is just around the corner its the perfect time to make some chili! Thank you for the list!!!! Great recipes! I love to make chili. 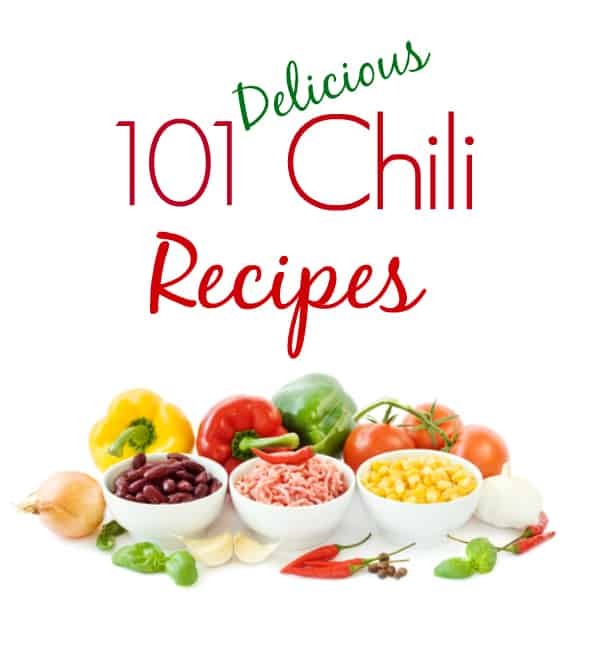 I’ve never seen such a wonderful collection of chili recipes. I am pleased to see a number of bean and vegetarian recipes. I am a vegetarian, and some of these look like “must try” ones. Wow! So many options! I think I’ll try the Hearty Vegetarian Beer Chili first! What a beautiful site you have! Thanks for featuring one of mine and I will certainly be storing this priceless list! Tis the season for a warm bowl of goodness for sure. Cheers! We have chili all the time here when friends are over because its so easy and just sits in the crockpot warm! Thanks for the great new ideas! Oooooooohhhh… I love chili! And with the weather being so cold, these recipes are perfect. I can’t wait to start trying the recipes. Will have to try some of these for my husband he likes chili. Thanks for including my recipe! Pinned. Thank you for all these links! Can’t wait to delve into some of these recipes. My family and I love chili and there’s enough great chili recipes to do us for a very long tme! Thank you! Wow, who knew there were so many different kinds of chili? I can’t wait to try a few of the chicken and turkey recipes. Thank you for sharing this great list. Amazing list! Thanks for including me! wow thanks for the list ! I wish I had my dearly departed mother’s recipe. She made the best chili! I remember it from my childhood as she made it to stretch out meals and our budget. Regardless, it was amazing! What a great list! Thanks for including my chili recipe ! this has gone into my bookmarks.